Blues for Bird is Martin Gray's stunning, one-of-a-kind biography of Charlie Parker. Written entirely in trimeter, Gray's epic biographical poem runs some 5,400 lines. The work chronicles the life of one of the twentieth century's most pivotal musical figures, from his humble beginnings in Kansas City through his pioneering of the breakthrough musical form of "bebop" to his early tragic death in the Park Avenue apartment of a European Countess. Gray's poetry dances nimbly along in a way that echoes Bird's blazing, fast-fingered solos, and his marvelous use of language reflects the rhythms of jazz and the beat that lies at the heart of bebop. Indeed, Blues for Bird is like a piece of jazz itself: exciting, innovative and constantly surprising. Blues for Bird not only functions as a primer on Bird, but as an introduction to the musical nature of jazz; it is a welcome addition to the library of any jazz or poetry aficionado. and knew him as the best. could swing it with the best. as Parker with his horn. ‘You’d hum a bar or two. ‘Don’t be afraid’ Bird said. and let him lead the note. would be a larger sound. when I performed with him. of any type or make. the sound he blew was his. ‘He knew just when to stop. of insights that he had. was live to play that horn. the changes they would make. he got back to the key. as that which Charlie played. band playing the tune straight. They keep on feeding him. just snatched Bird’s horn away. ‘Oh man, I heard a guy. at least a year with Hines. in comment on its power. all over his strong horn. There ain’t but few notes there. and just five sharps and flats. ‘We drew our warmth from him. We’re drawing on it still. or chew a stick of gum. ‘Night Train was its name. but the blues was what Bird played. He played like he’d been hurt. on notes and rests he made. he’d blow the key of B.
that he was never lost. as if his horn could sing. to make these little runs. at which the singers did. was Charlie’s reed of choice. but Charlie blew with that. based on the K.C. riff. with one great rhythmic thrust. backed by the rhythm group. and also Now’s The Time. what Bird alone could do. he leaves the tune implied. making of each a whole. of gender, race and class. The author of Jackson Pollock: Memories Arrested in Space and Blues for Bird is also one of the world’s foremost scholars of Alfred Lord Tennyson’s poetry and the editor of the Penguin Classic annotated edition of Tennyson’s Idylls of the King. In addition to his works on Jackson Pollock and Charlie Parker, Gray has published poems on Gilles Villeneuve and Amedeo Modigliani, and has taught at several major universities across Canada. He lives in Victoria, British Columbia. Blues for Bird shows the results of thorough research in its richness of information about Parker’s life and his impact on jazz. . . . Gray uses his charged words to illuminate the music, merging the terms of descent with a metaphoric allusion to Parker’s personal fate. . . . Gray’s epic gives us the life in full, the arc of Parker’s creation and his destruction. . . . Blues for Bird certainly can lead us to the music it celebrates. Most of the poem’s readers will probably already know the music, the words evoking it from their memories Koko, Orinthology, Scrapple from the Apple, Cool Blues. For such readers the experience will be enriched, deepened by testimonies to its greatness and by the sufferings of the man who made it. 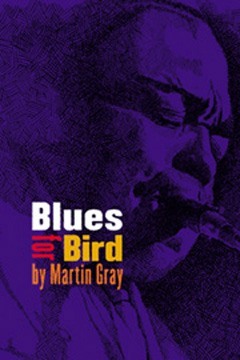 Gray effectively melds form and content throughout Blues for Bird. By using a heroic-narrative poetic structure, he is able to accommodate his biographical pursuits while capturing the seemingly mythic dimension of Parker’s life . . . Throughout Blues for Bird, Gray’s sense of reverence for Parker shines through this intelligent and captivating poetry. His knowledge of jazz music and this revolutionary period in American musical history is impressive. Gray has a sound sense of scholarship, and he naturally chooses his words and images with care. He has not only written a fine collection of poetry, he has added an important study to the growing body of scholarship devoted to Parker’s life. A remarkable book. By the time I finished it all along re-reading my favorite parts I felt as though I had read a full-length biography, watched several film documentaries, and listened to dozens of Bird recordings. The images linger, burned into the reader’s brain, like a sad blue sax tune playing over and over for days in one’s head . . . Again, this is a high quality work, stunning to look at, an experience to read.